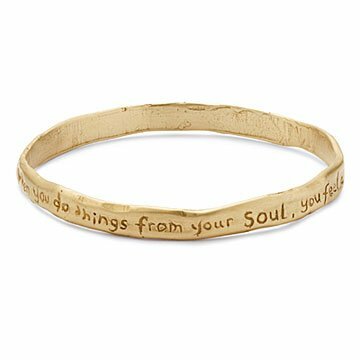 Keep Rumi's wise words close at hand with this golden bangle. As if plucked from a winding river, this enchanting golden bangle features an organic design handcrafted by Britta Ambauen. Inscribed with the poet Rumi's words of wisdom - "When you do things from your soul, you feel a river moving through you, a joy." - this lovely bracelet reminds the wearer to live with intention and let joy flow freely. Britta's encouraging and elegant jewelry is inspired by nature's beauty and an adventurous spirit. Handmade in Seattle, Washington. Gently rub the surface of the bangle with a jewelry safe polishing cloth to remove tarnish and dirt. Beautiful bracelet from a person with love for their craft. It's great to purchase from people that really love their craft and deliver excellence. The quality is fantastic and durable. I love this bracelet. My sister was thrilled to receive this beautiful bracelet! My sister won Outstanding Citizen and this was her gift because she is passionate (a river within ) about community theatre. She is raising 1.1 mil for a new theatre.